Justin’s note: As regular readers know, International Speculator editor Dave Forest says a commodities boom for the ages is underway… and the time to position yourself is now. But Dave says the ongoing trade war may be holding people back from taking advantage of this massive opportunity. But I’m not talking about bonds or U.S. stocks. I believe we’re kicking off a historic bull market in commodities. The commodities market is highly cyclical. And you don’t want to get caught in a commodities bear. It can be brutal. But when commodities run up, they really run. In the commodities bull market from 1971 to 1974, the GSCI – an index of 24 exchange-traded futures contracts that represent a large portion of the global commodities market – returned 371%. In the 1999 to 2008 bull, the GSCI climbed 454%. I believe that is the sort of return we can expect in the years ahead. But there’s one thing making resource investors nervous: the ongoing trade war. Today, I’ll show you why the trade war can’t stop the commodities bull that’s coming… and how it might actually jumpstart domestic mining in the U.S. In a landmark ruling, the International Telecommunication Union handed a tiny startup exclusive global rights to distribute what Bloomberg is calling “internet delivered from the heavens.” It will be fast… it will be everywhere… and it could cost one-eighth of what you’re paying right now. Cable internet providers are fuming, because insiders are calling this the end of the line for “America’s Most Hated Companies.” Untold amounts of money could be made as this massive shift takes place. And one opportunity will strike as soon as December 18.
Commodities investors have been jittery over the trade war. But it’s particularly true of mining investors. In June, the White House slapped a 25% tariff on some $50 billion worth of Chinese imports. Copper prices fell 22% from early June to mid-August. Other base metals fell as well. Nickel dropped about 23% between June and August. Zinc plunged about 28% over the same timeframe. But if you look at the details of the tariffs, you see that none of these metals were targeted. Finished products – such as lasers and laundry equipment – were singled out. But investors assumed the worst and hit the sell button all the same. We’ve seen a rebound in some of these metals’ prices since then. Copper has jumped about 9% since mid-August. Zinc is up about 15%. One of the catalysts was likely the new trade deal between the U.S., Canada, and Mexico. President Trump wasn’t a fan of its predecessor – the North American Free Trade Agreement (NAFTA). He thought it was a “bad deal” for the U.S. The concern was that ripping up NAFTA would be bad for steel and other metals that cross between Mexico, Canada, and the U.S. But in late September, these countries struck this new trade deal – the United States-Mexico-Canada Agreement (USMCA). We don’t have to get into all the details about the deal. Investors were likely just happy that something got done. Copper traded at a three-month high shortly after. And there was another piece of news that got almost no coverage. On September 30, China’s Ministry of Finance announced it was slashing tariffs on base metals and steel from 11.5% to 8.4%. Tariffs on other mineral imports were cut from 6.6% to 5.4%. A strange new money may be coming to your state… Hundreds of strange new ATMs are popping up from the private sector. 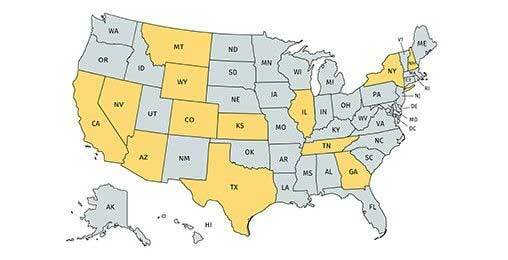 And Teeka Tiwari, America’s #1 currency expert, says this may lead 13 U.S. states to move towards issuing new “state money.” Will you be affected? And what does it mean for your savings in American dollars? China is one of the fastest-growing economies in the world. It’ll soon have the world’s largest middle class. That economic growth is impossible without copper and nickel. Copper is used in building construction, consumer electronics, and automobiles. And China is heavily dependent on copper imports. 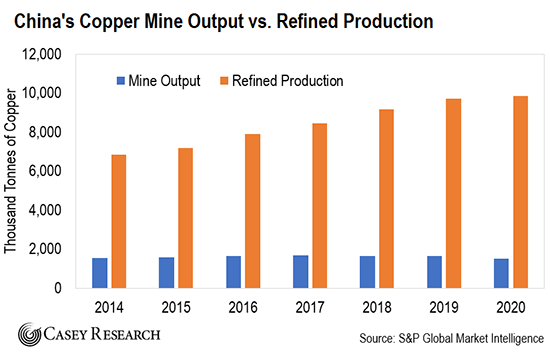 In 2017, Chinese smelters put out about 8 million tonnes of refined copper. But the country mined only about 2 million tonnes. It had to import the rest. The demand for copper is forecast to rise to about 10 million tonnes by 2020. But production will more or less stay flat. It’s simple. The growing demand for refined copper in China far outweighs what the country can dig out of the ground each year. This shortfall has to be made up in imports. It’s a similar story with nickel. China wants to be the world leader in electric vehicle (EV) production. Nickel is an essential metal for EV batteries. 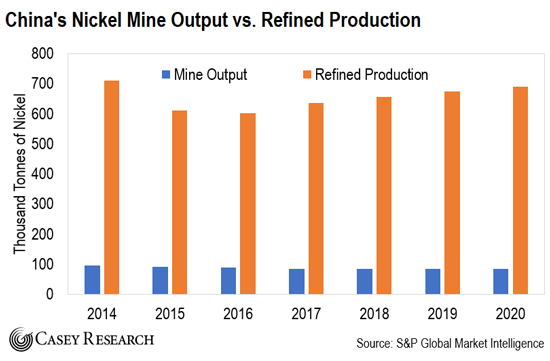 But again, China can’t mine enough nickel to keep up with production. Only about 14% of the nickel that goes into Chinese smelters is mined domestically. Neither China nor the U.S. wants a trade war. It slows down economic growth. Neither country wants to see that happen. My hunch is that a lot of this is political posturing. There’s a good chance these trade disputes will get resolved sooner than people think. What do you think will happen for commodities if the U.S.-China trade spat officially ends? It’ll be off to the races for commodities. The Trump administration is actively supporting the growth and expansion of the domestic mining sector. Countries are learning that they can’t be too dependent on others for their essential commodities. Politically motivated tariffs and other sanctions could quickly disrupt the entire supply chain. As an example, China supplies about 78% of the rare earth elements (REEs) imported by the U.S. REEs are a group of 17 chemically similar minerals that tend to be found in the same ore deposits. These elements are used in everything from microphones to wind turbines to the electric motors in hybrid vehicles. But the U.S. is dependent on China for its REEs. If China decided to stop shipping REEs… or if it slapped punitive tariffs on them… U.S. manufacturers of products containing REEs would be in a tough spot. So instead of relying on China, the U.S. is looking to kickstart domestic mining. In September, Congress approved a $727 million funding package for fossil fuels research – a key focus being to extract rare earth elements from U.S. coal deposits. And it’s not just rare earths. That makes it easier for American miners to set up shop and get a mine up and running. This government support is attracting major mining firms to the U.S. at a rate I’ve never seen before in over two decades in this business. Trade war fears are overblown. The U.S.-China trade dispute is no excuse to sit out the coming bull market in commodities. This is a trend you’ll want to keep on your radar for the foreseeable future. And flood a tiny, $2 stock with a massive windfall starting soon. Go here to learn more. Wherever there is gambling of any kind no matter what it is called, there are more divorces, more people on welfare, and more crime which produces a net loss of tax dollars. These are time proven facts and the majority of gamblers are already poor people. There are good reasons why these activities are not legal. Maybe people’s lives are ruined by gambling and drugs. There are safeguards knowing we have the tendency to overindulge. Yes, lots of money, like with human trafficking, street drugs, prostitution etc… humanity over profit, please. So no thanks, but you’ve got the mind of a politician, all right. Master trader Jeff Clark says 2019 will be the year of the trader… and he’s about to do something he’s never done before. On Thursday, December 6, at 8 p.m. ET, Jeff will pull back the curtain on a trading technique he developed. During this special broadcast, he’ll walk you through a live trade, with his own account, on camera. And he’ll be talking through a few trading ideas he has his eyes on right now that may trigger in the days ahead.